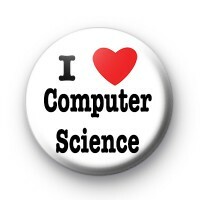 An I Love Computer Science badge in white, with a bright red love heart. Perfect for all Computer Science students & teachers, university lecturers and graduates of Computer Science. Whether it's database systems, AI, computer security or programming, this is the perfect badge for you. Standard 25mm button badge hand made in our UK workshop.